Wooden Board Empty Table Top On Of Blurred Background. Perspective Brown Wood Table Over Blur In Coffee Shop Background. Photo title: Wooden board empty table top on of blurred background. Perspective brown wood table over blur in coffee shop background. Wooden board empty table top on of blurred background. 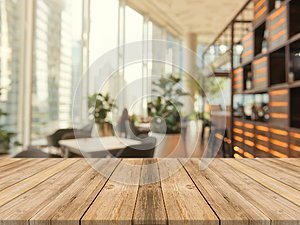 Perspective brown wood table over blur in coffee shop background - can be used mock up for montage products display or design key visual layout.